Audia Strumento's GoldAmp A100 weighs only 800 grams. 800g of gold at today's prices would cost around $39,200. Its MSRP however, will be between $48,622-$51,490. Sure it's expensive but this is what audiophiles get wet dreams about. Top of the line components are a given at this price point but in addition to nice guts, it's packing as few wires as possible. The idea being that less distance to travel means fewer opportunities for signal interference. The price also includes the special gold lacquer which supposedly looks just like the real thing. 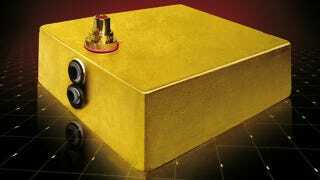 The only real golden thing about this amp is the sound it outputs.